Being a reblog of the Little Red Reviewer‘s review of A Natural History of Dragons by Marie Brennan. In early 2012 I found my favorite book of 2012. I figured it was a fluke, as how can you read something and know nothing else could compare? 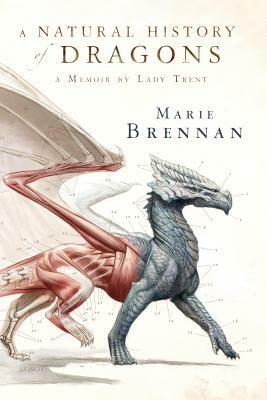 it’s only March of 2013, and yet again, I can tell you without a doubt, Marie Brennan’s A Natural History of Dragons is one of my top reads of this year. Not into fantasy? Don’t think a book with a dragon on the cover is for you? I don’t care. Read this book. Like its main character, it transcends expectations. Marie Brennan has written a book I’ve been waiting a very long time to read. All this talk about strong female main characters? Women who fight for what they want, who are strong yet impulsive, intelligent, vocal, protective towards their loved ones? Brennan gave me all of that and took it one step further. She gave Isabella Camherst the most important personality trait of all: she made Isabella completely realistic. How to describe Isabella? A naive and sometimes thoughtless (not out of malice, simply out of ignorance and impulsiveness) woman who sees nothing odd about being only woman in the room, and who can’t possibly understand the unintended consequences of not caring about societies expectations for her gender. forgive the presumptuousness, but it’s as if Brennan spied on me when I was nineteen years old and wrote a book about my imaginary alter ego. Dragons were never my forte, but I do recall many a college course where I was the only female, being secretly jealous of other women my age who made looking and acting feminine so easy, while at the same time knowing their lifestyle wasn’t for me. I feel like this book was written just for me. Like Isabella, I often felt confused and trapped by societies expectations. Written as a memoir, an older and wiser Isabella is looking back on her life, often judging and laughing at her younger self. We get a few chapters on her childhood, her fascination with birds and the tiny bird-like dragons called sparklings, how her brother sneaks books from their father’s library for young Isabella to read. But all little girls must grow up to be proper young ladies, and she soon gets to an age where looking the part to find a husband is more important than one’s private hobbies. Not as an indulgence, but out of respect for his daughter, her father attempts to match her with suitors who will respect her intelligence in turn, and also have the large libraries. (again, Ms. Brennan must have been spying on me. I knew he was the one because his bedroom was filled with books). She meets her future husband, Jacob Camherst, they bond over an intellectual love of knowledge and dragons, and make plans to live happily ever after. Beyond a character who spoke to me on a personal level, Brennan builds a fully realized Europe-esque secondary fantasy world to play in, complete with different religious observations, languages, cultural identities, historic population movements, and a scientific society on the verge of the modern age, with airplanes and large ships hinted at. This is an age of discovery, when salons and colloquiums existed to share discoveries of natural history and archaeology with all interested parties. Budding authors take note: Worldbuilding? this is how you do it. The majority of the story itself takes place shortly after Isabella’s marriage to Jacob. She convinces him to take her along on a scientific expedition in a remote mountainous village in the country of Vystrana to learn more about the dragons that live there. Their guide mysteriously absent, at first all the expedition finds is irritated villagers and a few unwashed smugglers. The elusive dragons seem to only appear to attack humans, something they have never done before. As more information about the dragons and their lairs are uncovered, inexplicably strange things begin to happen around Isabella. I don’t mean to lead you on with that last sentence, this is not a traditionally suspenseful story. It is truly written like a memoir, with little in the way of cliffhangers or melodrama. After many sensational stories written about her during her lifetime, Isabella is trying to set the record straight, to tell the public what really happened, all those years ago. She doesn’t care whose feathers get ruffled, or how many hurtful memories she must dredge up. She judges her younger self just as harshly as she judges others, she has regrets and missed opportunities. I couldn’t get enough of her voice, and I simply must know more about her life. Not traditionally suspenseful be damned, I couldn’t put this book down. I wanted to know what was in the caves they found, I wanted to know exactly why the village priest thought they had attracted evil spirits. I wanted to catch one more hint of everything Brennan borrowed from to create her perfect secondary world. I desperately wanted to know what is store next for Isabella and Jacob. I wanted to hear more of Isabella’s voice. Very long story short, I loved everything about A Natural History of Dragons. From the characterization to the worldbuilding to the dragons themselves, everything was flawless. I hated only that it had to end. I take solace is that I’ve heard from a very reputable source that there are two more books planned about Isabella, Lady Trent.